This is a list of Properties that should make use of units, but currently do not. It is not exhaustive, but what I could find by browsing through the tools and properties. I can update this list if anyone notices any more examples. Using consistent and correct units is a massive help for users, and makes it much easier to understand what values represent. We already have a nice units system in place - we just need to actually use it more. Needs refactor: This option is weird, it is a frame number that relates to the total frames set in path_duration. These options could be removed - they are superseded by the Follow Curve constraint anyway. Subsurface Radius in both Subsurface Scattering and Principled BSDF nodes (Distance) - how accurate is that? Example? Also such units don't work well in a node system. D4281: Add units to text curve offset_x and y. Would you prefer to get single revision for multiple positions from the list above, or multiple separated by context? Particles/Modifiers, etc? @Łukasz Kwoska (Szakulus), while I'm happy you want to help, I would like to not finish every just now so that maybe other can give it a shot as well. Let's at least wait until monday. Then feel free to make a patch that contains fixes for multiple contexts. Those tasks are a bit harder, but should still be achievable. I am against the idea to convert every numerical value setting normalized between 0 and 1, a percentage look. Sometimes, pertinent range, when a significant change occurs, is a tenth. Sometimes, it is an hundredth. Sometimes, it is a thousandth. When the tweak needed has to occur at the fourth digit after coma, presenting things as percentages does not help at all. I also don't think that expressing key values as portion of seconds is more meaningful for user than a frame number. An approximation in time may be visible in tooltip according to frame rate. A automatic conversion from typing 10s to frame 250 may help. But nothing can be more accurate than frame number. Well, we would not be getting rid of frames, obviously. I think the default display should be in frames. But, currently, if you want to, say, make sure your shot is exactly 10 minutes long, you can't easily do that. You'll have to type in 10*60*60*[fps]. This is very clumsy, and slow if you want to tweak or change it. It could also be that you would like to make the life of particles last exactly 2 mins and 30 seconds. That's also a pain currently to input. This is exactly the same use-case as for length units. Some people also argued that we should not include the ability to use real-world units for lengths. In the end, using real-world units makes things easier to understand and use, and much faster too, esp if you want to type in time lengths in minutes or hours. You don't have to do back-of-envelope calculations all the time. 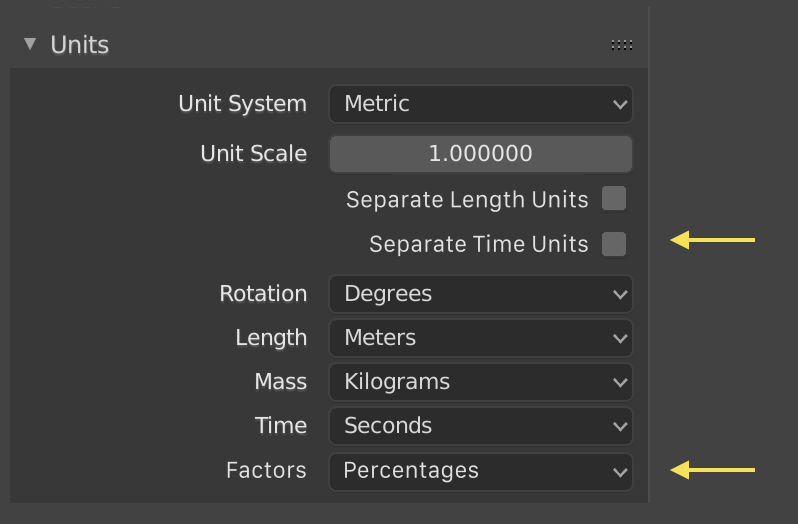 As for percentages, we agreed above to display factor values by default as 0-1 still, but with an option in the Units panel to display them as percentages. However, your argument makes no sense. You can have percentages written out as 100.0% or 100.000% if you need. That's no issue. With the option to display factors as percentages, if nothing else, I expect we will discover loads of places where prop_factor should be used but currently is not. Shutter time is not a typical time unit. @Brecht Van Lommel (brecht): What is shutter time in then? I thought it's the time (in frames) in which the shutter is open? Same for Rolling Shutter Duration. That is also a time unit. How is it not? So I don't get that. In what way are these two properties not measured in time? "It's a measurement of time in relationship to the frame rate." The proper measurement (and unit) is Degrees. This video explains it. We could measure the shutter in degrees, and that might be nicer, but the actual, current property value *is* a measurement in time. All our time properties are currently measured in frames, and so they are *all* relative to the frame rate - so this is no different. @Jacques Lucke (JacquesLucke) Absolutely. Right after sending this comment I thought exactly this. Thanks for T56950. That's what I wanted to ask for. This comment was removed by Joel Godin (FloridaJo). This page explains the process of creating a diff. It's the same for Linux and Windows. and should be called Size, expressed in px. The patch deals just with the UI part, not with the python property (I suppose it may cause incompatibility with some addons). @Joel Godin (FloridaJo) That's just the hash of your local commit, Jacques won't be able to commit any code with that. It seems you have some trouble with the process so let me try to explain it to you. The reason this is done with git even for two lines of code is to have a consistent and predictable end result when you've got several people working on the project. So let me walk you through the steps (some of these may be obvious to you, but just I'll write them down anyway in case this is something you're unsure about). Open a console/terminal and navigate to a folder where you want to put the Blender source code. The command for this is cd followed by the directory name. Clone the Blender repository using git clone http://git.blender.org/blender.git. This creates a local copy of Blenders code and allows git to track both your local changes and the ones contributed by other developers. If you want to update your local repository you can use git pull to pull in the lastest changes. When you clones the repository you are on the master branch. You can think of the git repository like a tree, the master branch is the trunk and when you want to develop features based of the master you can create a new branch. The branch uses the master as a starting point, but all code changes of the new branch don't impact the master until you merge the changes back (that has to be done manually). So if you want to create a patch, it's a smart thing to create a branch for it, just to be safe that you're not creating any conflict. BTW you can't directly push changes to the remote Blender master branch anyway, this is for the core developers only. That is why you've got to upload a diff, but more about that later on. Create a branch and switch to it for your changes git checkout -b some-new-feature where some-new-feature can be any name you want. This command creates a branch and switches to it. You can view your local branches with git branch, the current branch is marked with an asterisk *. You can view all branches including the remote branches on Blender's server with git branch -av. Now that you are on your feature branch (make sure that you are!) you can edit a file. Compile Blender and make sure everything is running like it's supposed to. I won't get into detail here because there is a tutorial here. Once everything looks good you can add and commit (read as save permanently) your changes to the local branch. Git creates a history of all changes created with commits, which allows you to see every edit made and revert to a past state if necessary. Use git add /path/to/changes/file.c to stage files that you'd like to commit (replace the path with the actual path and filename that you have changed). Once you've done this for every file you can git commit -m "text explaining why and what you've changed". Once you've run this command you have stored your changes to your branch locally. Creating a diff is basically to identify changes that exist between two branches, in this case between the master branch and your branch for the patch. git diff master..some-new-feature > some-new-feature.diff compares the code of the master branch against a branch called "some-new-feature" (replace it with the actual name of your branch). The differences, hence the name for the diff command, are written to a file using a redirect > of standard out (stdout) to a file called some-new-feature.diff. You can add a path in front of the filename because you'll likely don't want the diff file in the git directory. Now you can upload the created diff-file on this page. Upload you file under "Raw Diff From File". Choose the repository this diff is for (likely rB Blender in your case). You'll have to confirm your changes and if you know who is maintaining the specific project your want to contribute to, you can add them as subscribers. Once this is done it may take a bit for other developers to verify you changes. If they aren't happy with your changes, you may have to update your patch and they'll review it again. When everything looks good, they'll commit it to the right branch in the blender repository. In case you work on a larger project and need to keep your branch up-to-date with the changes of the master, you'll have to change to the master branch git checkout master, pull the latest changes, switch back to your feature branch using git checkout some-new-feature and then rebase using git rebase master. @Riccardo Gagliarducci (rickyx) I think 'resolution' is actually the correct term. Changing these values doesn't change the size, and doesn't change *what* you see, but the amount of pixels used to describe what you see. You get the same image but with more or less pixels defining it. That is what resolution is. A 27" TV which is 4K has higher *resolution* than a 27" TV which is HD. Size is has to do with how you are viewing your image. You can view a 320*200 image in an IMAX theatre. That is a huge size but low resolution. Resolution is how many pixels are used to describe an image. An 8K image displayed on a postage stamp is tiny, but has real high resolution. @Joel Godin (FloridaJo) Have you tried building it from the console using make? This will give you a detailed output on what went wrong. @Joel Godin (FloridaJo), please ask for help on IRC or on devtalk.blender.org when you have build problems. This task is not the right place. I would like to add my 2 cents here on the debate. As Brecht said about graphics, 0-1 is the common factor. "For example, when shooting at 25fps, your shutter speed should be 1/50 of a second. If your camera can shoot at 50 or 60 fps, your shutter speed should be 1/100 or 1/125 of a second. The reason for this 180-degree rule is because it helps us to record video that contains natural movement. everyone in your scene will look like robots or as if they were recorded in stop motion. or Multiple Gaussian Blurs blended. width and height will be radius*2 + 1." Yes, absolutely agreed, it would be nice to change the shutter to be in degrees rather than in frames. This is how you set the shutter speed in film cameras. A 180 deg shutter is more correct that a 0.5 shutter. I'd like to mention one that's been confusing me forever. Randomize Transform has meters as the unit for location and scale. For location this makes sense, but for scale I feel it doesn't. Also, if I understand it correctly, setting this number to 1.15m would set the boundaries for the randomisation to 85% - 115%, which is not very clear in this UI. Lose the meters unit for the random scale part of the tool, and display the input as the factor it actually is. Work with actual, defined boundaries in the UI - minimum and maximum. I feel this offers more control and predictability than using one number that the user has to imagine going in both directions of the axis. @Sam Van Hulle (sam_vh) Yes, that's true. That seems like a mistake. I added it to the list. As for your proposal on how Randomize Transform works, it's outside of the scope of this task. This is just about giving values the correct units. William Reynish (billreynish) mentioned this in D4268: Fix: use correct units for some force field properties. 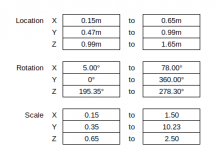 In the description we refere to "Common measurement". ampere, kelvin, second, metre, kilogram, candela, mole. Many of the derived units also adhere to the standard, used in most countries ( all except US, Liberia and Myanmar ). Can the intention to take this standard as a point of reference (and, for example, use the Celsius degrees) be made explicit and be used everywere it is possible? The Smoke Density you are referring is the density in smoke behavior? in that case we should or use a proper scale ( Bacharach, Ringelmann, ... ) or using trasmittance in relation to density (mass). Or having two different names? The main thing for the units is for them to be convenient to users, if they can be SI units even better but I don't think it's a hard requirement. The smoke density unit is actually 1/m, fixed that in the table now. It's a little confusing with standard physics "density", but common terminology in computer graphics. It’s not a hard requirement, but this task was meant to illustrate the missing unit types corresponding to property values we already use. Physical properties without specified units makes them much harder to set. We could also add more unit variations to the units we already support, such as using Lumen as well as Watts for lights. As for smoke density, I think you are right. For smoke behaviour the correct unit IS kg/m³: the fluid moves up or down because of his density (but says nothing about his appearance). This is related with the temperature diff. params (witch should be a delta). For smoke optical density, in shaders, the correct unit should be trasmittance T ( if it is the way the shader has been coded ). 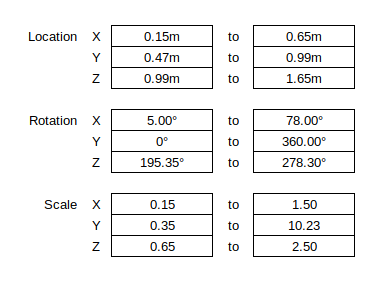 For light Lumen -luminous flux- cannot be converted in Watt -radiant flux-, as those units describe different quantities: the chosen unit should be in accordance with the code of the emitter. I suggest that using preferably SI may appreciated by users who approaches blender (and can find on wikipedia the quantities expressed in a consistent way): many simulation packages use this approach. The volume density that the task above refers to so far is for shaders, and there it is an attenuation coefficient with unit 1/m. There may be other settings in the smoke simulation that need different units, that would need to be figured out property by property. There may be one that has unit kg/m³, or maybe the density is specified indirectly through other properties. For lights, it can be useful to be able to specify the Lumen exactly, taking wavelengths into account. However there are shader nodes or light shapes for which we can't efficiently predict the effective luminous flux, and it's often not convenient or incompatible with other CG software. In that case we might still use a Lumen unit that is correct if you assume e.g. a white light without textures, and consider the color to be a multiplier on top of that. Hasn't the bevel amount one been changed?